Solar Intersections is a commissioned work by renown artist and educator Robert Behrens. 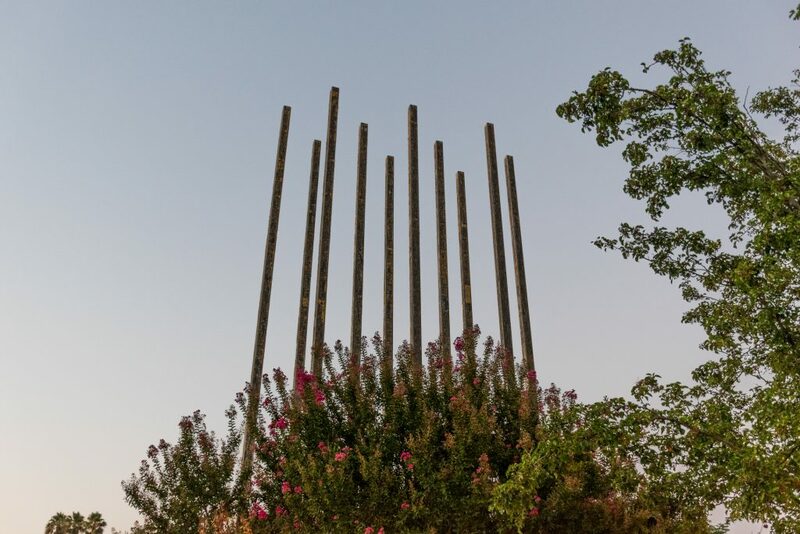 The installation built in 1989 includes sixteen 70-foot-high steel poles coated with a special adhesive paint on which solar panels are placed. Framed by crate myrtle trees and perennial flowers planted in a checkerboard pattern, the artist created an entire setting to reflect the place in which his work is displayed. Over 30 of Behrens’ masterpiece sculptures made with a variety of metals and materials such as steel, granite and cement can be seen across the U.S. from Fairbanks, Alaska to Cambridge, Mass. Solar Intersections is one of California’s outstanding artworks and like Sundial Bridge in Redding, should not be missed. Visible in the distance as its spires beam reflected light, the magical changing colors only nature can produce draw you into not one but many rainbows in which you become the master, manipulating the colors yourself as you change positions. In addition to reflecting light, themes such as use of solar energy use, transportation, nature and the interplay of the earth and sky are prevalent in Solar Intersections.